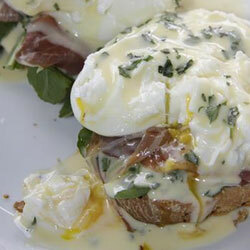 For the Hollandaise, Combine the egg yolks, lemon juice, water and salt in a blender and blend until frothy. Slowly pour the melted butter through the funnel whilst still beating the mixture until the sauce is thick and emulsified (you might have to use a tiny bit less butter than stipulated). Add the fresh mint and pulse a few times and set aside. Poach the eggs in a saucepan filled with about 2l of water. Add the vinegar and allow the water to come to a boil, reduce the heat and allow it to just simmer gently. Individually, break the eggs into small bowls or cups. With a wooden spoon, stir the water and slowly slip in the eggs. With a spoon, gently nudge the egg white closer to the yolk. Poach for about 1 minute and remove with a slotted spoon. Reprinted with permission of Simply Delicious. To see more recipes, click here.